In a nutshell, paper writing techniques are merely tactics used in rewriting a text in a different way. Writing a paraphrase means restating the idea of other people in your own words, meaning that you write the idea of the author by using some of the key terms in your own sentence structures and words. With sentence paraphrase, you can tap ideas from the work of other people in order to keep away from plagiarism. And we will tell you all about how to reword a sentence properly. In a situation where you write a text or quote it, it means that you are putting it in an exact manner it was written. This is quite different from paraphrasing because you are writing what another text has said when you are paraphrasing. Paraphrasing and its tactics are very important, particularly in academia. This is because a report or essay copied verbatim will not yield you any mark and even reveal your poor academic and poor writing skills. Paper writing lets you discuss ideas from the point of view of the author and acknowledge the author in-text citation and keeping away from plagiarism. 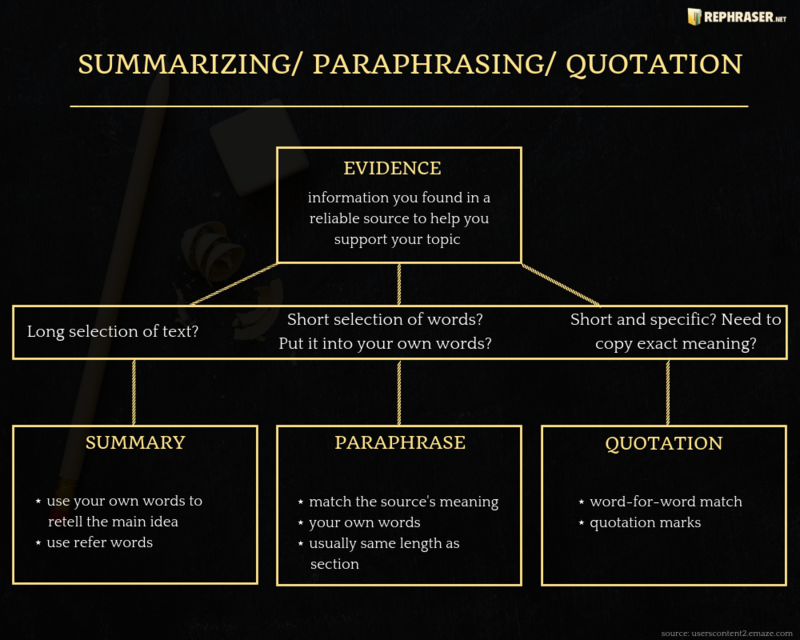 You also need to use paraphrasing techniques because they reveal that you have actually read and understood the original text when you paraphrase effectively. Change a word from a part of speech to another – E.g. Original: Benjamin Paul, a medical professor says that universal changes are controlling the spread of disease. Paraphrase:: According to Benjamin Paul, a professor of medicine, changes all over the universe are causing diseases to spread (Paul, 2004). Make use of synonyms – E.g. Original: The United States government affirmed that the AIDS predicament causes a national security menace. Modify percentages and numbers to different forms – E.g. Original: Minority groups in the United States have been strike hardest by the outbreak. Change the order of word order this might including moving modifiers to different positions or changing from active voice to passive voice. E.g. Original: Gabriel (2003) stated that malaria kills over one million people yearly; the devastating majority of them are kids in sub-Saharan Africa. Paraphrase:: Each year, over a million people are killed by malaria, and the majority of the sufferers are children who live in sub-Saharan Africa (Gabriel, 2003). Make Use of different definition structures – E.g. Original: Lyme disease is a rabble-rousing ailment caused by a bacterium spread by ticks. Make use of diverse attribution signals – E.g. Original: “That is for the reason that there are several unusual ways the diseases could have come,” veterinarian Steven Malta affirmed in his new book, Seven Contemporary Plagues. Paraphrase:: According to Steven Malta, a veterinarian who wrote Seven Contemporary Plagues, the disease could have come in many ways (Peterside, 2005). 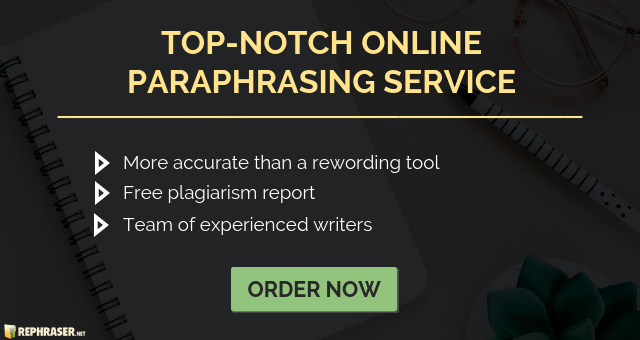 With knowing some of the paraphrasing techniques you can boost chances to paraphrase effectively your papers. Even if you have a lot on your plate and you are owing to lack of time, there is always a solution. Just get in touch with our reliable paraphrasing service and get you paper paraphrased quickly and professionally! How to Paraphrase in Your Own Words Effectively? So what is effective paraphrasing? As mentioned earlier, a technique that lets you borrow ideas from the work of other people in order to avoid plagiarism when you write a text is referred to as paraphrasing. It then means that you should cite the source of whatever you paraphrase in your own words. Your paraphrase may be regarded as being plagiarized if you fail to cite the source properly. If you use a phrase or term word for word from the original work, use quotation marks! Read the original text more than once until you have a clear understanding of its meaning very well. Jot some points down on what you understood about the text without looking at the at the source. Changing a number of words in the original sentence to diverse parts of speech. In most cases, you will frequently need to change the order of the word as well as some other words. Studying on regular basis is the most helpful way of developing your English for effective paraphrasing. Additionally, you can discover some self plagiarism examples, in order not to make such a mistake while writing. There are so many reasons why you might want to rephrase something but if you have limited knowledge of proper paraphrasing our experts are ready to help you any time! Just get in touch with our available 24/7 online support team and get your perfectly written and well-polished paper in no time! Pay adequate attention to punctuation, particularly to the right use of commas and periods in order to control the flow of your thoughts. Paraphrasing techniques can be described as tactics you use whenever you are rewriting a text in a different way. On the other hand, when you paraphrase, it means that you are re-emphasizing the idea of other people in your own words. This means that you put the idea of the author in your own words by making use of some of the major terms in your own words and sentence structure. You can get an idea from other people’s work to paraphrase your own text. 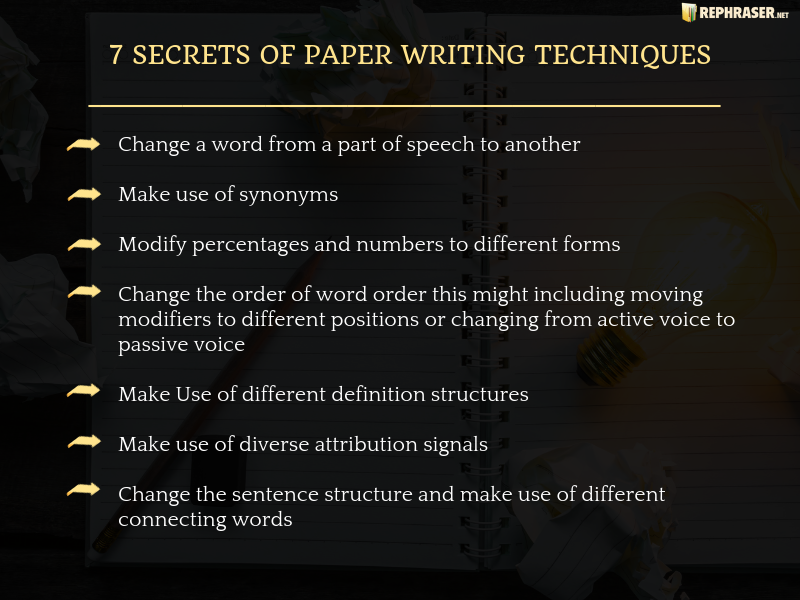 However, you must understand the secrets of paraphrasing techniques before you can be able to paraphrase effectively. Therefore, use dissimilar attribution signals, make use of diverse definition structures, change a word from one part of speech to another, use synonyms, change percentages and numbers to different forms and change the order of words. All these areas the secrets you need to know about effective paraphrasing. Try as much as possible to bear these secrets in mind whenever you want to paraphrase. Are you a beginner to paraphrasing or do you want to learn more about paraphrasing techniques? Click here to learn more about the secrets of the paraphrasing techniques!